The proposal is intriguing. A space entrepreneur has only has to read Mining the Sky to salivate over the potential of extraterrestrial resources available to us on asteroids. But in the near term, what I am most interested in as an entrepreneur is Lockheed’s plan to leave one of the two Orions in orbit after the manned asteroid mission - able to reused over multiple trips. This “stretch” Orion would forgo the heat shield in favor of modifications making it more conducive to long duration space flight. One Orion capsule (the one with a heat shield) would reenter with Crew and samples after each mission. The stretch Orion would remain in orbit ready for future asteroid missions or to serve as a long duration space lab in LEO. Philosophical Logic: The debate over “reuse” or “launch new” continues to rage (or at least simmer). For LM to recommend a solution that contains such a large reusable component, this means the largest defense contractor on the planet has given the nod toward near-term technologies like depots and space tugs as well. Although not mentioned in the Plymouth Rock presentation, such technologies like propellant depots and space tugs would be needed in order to prepare the stretch Orion for a follow-on mission. We have already seen companies like ULA and Boeing make recommendations for depots and tugs, but to date we have not seen much from Lockheed Martin on the subject. Altruistic Logic: For humans to become truly space faring, cost minimization of permanent space logistics must become more important than capability maximization. Reusable components are essential to create sustainable space logistics solutions. Profit Logic: A clever risk-tolerant company could make a lot of money with a reusable man-rated asset in orbit (especially if LM retains ownership after the primary mission with NASA concludes). Sell experiment space on-board as a long-term space lab (much less vibration than on the ISS) – dock with ISS to take on experiments, but fly remotely without crew for long durations. How would you make money from a stretch Orion? My mother tells a story that when I was six years old, I told her I wanted to own an “Astronaut Company”; not “be an astronaut” but own an astronaut company. No surprise, years later, I work on the business side of the aerospace industry. And so I have been following with interest the start of Astronauts for Hire, a non-profit organization tasked with preparing the next generation of commercial astronauts. 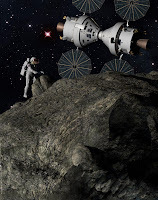 It is not hard to imagine a future where Bigelow stations dot low earth orbit and business owners are evaluating opportunities in orbit on such facilities. One big question for businesses will be the human question: as a business owner, how will my efforts on orbit be carried out? Who will maintain my experiment on orbit? Who will run my camera for the film shoot? Who will pack the latest batch of protein crystals for their return trip to earth? Who has the micro-gravity experience to serve as Butler and maids at my hotel? Do I bring these resources up to station with me or purchase a more turn-key solution where I provide the mission and others provide the space station and astronaut solution? Astronauts for Hire offers a piece of that puzzle. Bigelow will no doubt hire/train a core group of astronauts themselves, especially initially. But if another company(s) can provide astronaut services at a lower cost, down the road, Bigelow may happily subcontract this portion of their service. Additionally, I can envision a day where the rich and powerful own space yachts made out of customized Bigelow modules that they purchase for hundreds of millions of dollars each. Such yachts may need to be tended when not in use and serviced with the owner on board. An astronaut company could offer such a service. Such a need for a commercial crew, will expand the scope of the “astronaut” from scientist and pilot to include, perhaps, any human service performed on earth – all carried out in micro-gravity. Currently, Astronauts for Hire’s service is limited to training the next generation of space pioneers. This training could grow to actually offering scientists on orbit as needed, and eventually for A4H or another company to offer any “LEO Human Service” on orbit. Scientists, pilots, repairmen, construction workers, cooks, maids, and more. This would be the true Astronaut Company. This only confirms: all my best ideas I had by age six.